Children’s Electric Bikes from Revvi 2019 new design. 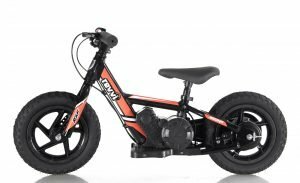 Boys and Girls ebikes. 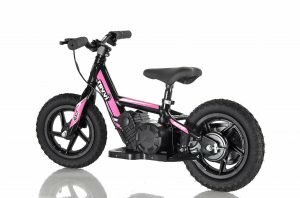 A super light electric-powered motor bike that has been specifically designed for boys and girls. Weighing in at only 9kg’s. Start them young using the bike as a conventional balance bike with its specially designed free wheel system. Then watch them improve and progress onto the slow speed setting (5mph) balancing on there own using the foot pegs. Perfecting there throttle control at the same time using the bikes twist throttle. Once they are confident using the slow speed setting they can then progress to the fast speed setting (10mph). 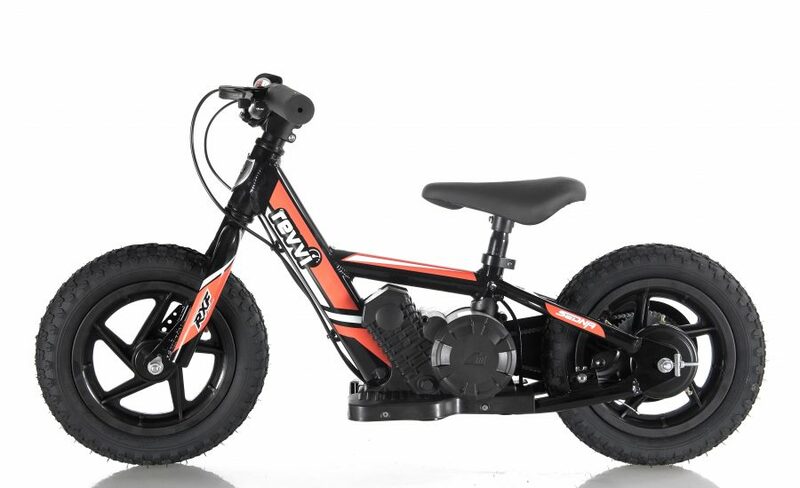 Features hybrid tyres suitable for on and off road use & a chain-driven motor that delivers reliable performance. 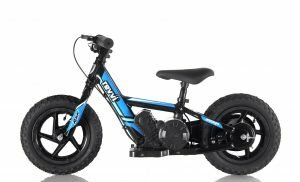 Children’s Electric Bikes from Revvi 2019 new design. 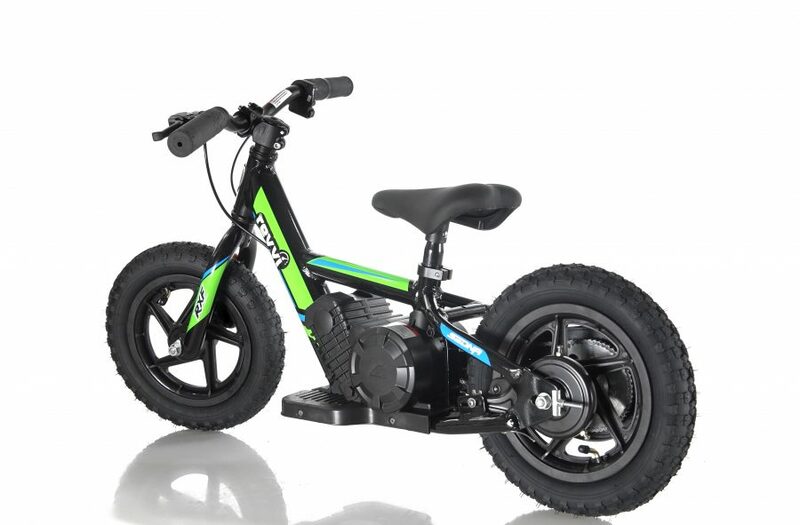 A super light electric-powered motor bike that has been specifically designed for kids, Weighing in at only 9kg’s. Start them young using the bike as a conventional balance bike with its specially designed free wheel system. Then watch them improve and progress onto the slow speed setting (5mph) balancing on there own using the foot pegs. Perfecting there throttle control at the same time using the bikes twist throttle. Once they are confident using the slow speed setting they can then progress to the fast speed setting (10mph). 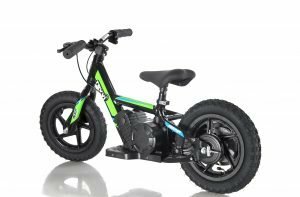 Features hybrid tyres suitable for on and off road use & a chain-driven motor that delivers reliable performance. Large rubber air filled hybrid tyres suitable for on and off road use. Battery range of up to 1 hour of constant use. 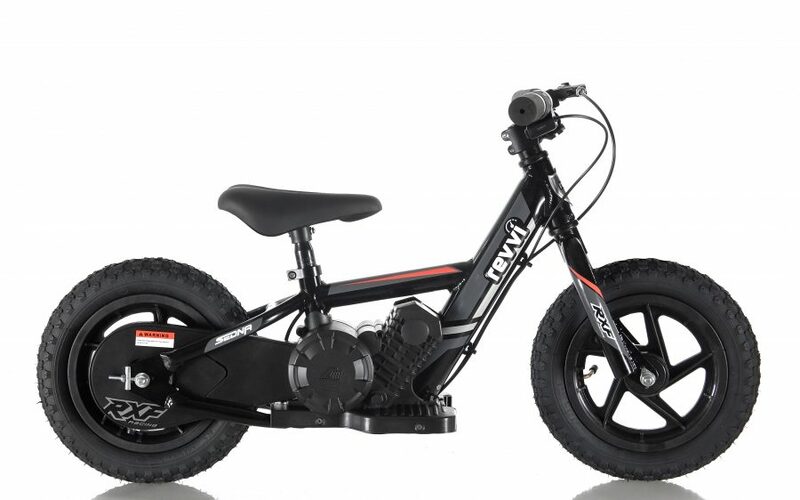 Charge time: Only 1 – 2 hours. Specially designed brake lever for kids with rear drum brake..
Aluminium foot pegs with plastic cover for grip. External charge port for easy charging without battery removal. Specially designed rear wheel with free wheels system, this allows the bike to be used as a conventional balance bike with out the power. The use of this product can be dangerous and could potentially cause serious injury. Children must be supervised at all time when using this device. Anyone riding this device must wear a helmet, knee pads, elbow pads and gloves. Keep away from steep hills, other vehicles, roads, bodies of water, animals, pedestrians and be vigilant of any other potential hazards before use. Please read all assembly and safety instructions before use. By purchasing this product you accept responsibility of the devices proper use, maintenance, supervision of rider and all risks associated with its use. The retailer and manufacturer are not responsible for any damage, injury or death resulting from the use of this product. It is always at the discretion of the parent or person supervising as to the age of the rider. Motor – 24V 100W brush motor. Battery – 24V 2.6AH Lithium ion. Brake – Rear drum brake. 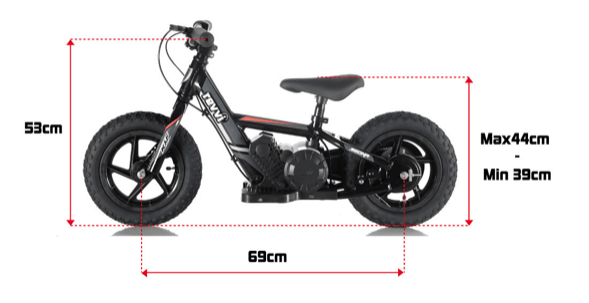 Distance – Up to 1 hour riding. Max speed – 5mph / 10mph. Please note the riders age is always at the parent or guardian’s discretion! Each bike comes with a UK charger, owners manual and tool kit. In stock delivery: 3-5 working days. £25 in mainland UK for Mon-Fri delivery. Saturday delivery is available for an extra £25. Please call us or email us at: [email protected] for prices for delivery to Scottish highlands, UK islands and Northern Ireland. You can also check this information on our shop page when you enter your post code. If you change your mind, you must notify us in writing within 7 days of the receipt of your RooDog to [email protected]. With the proof of purchase! We will refund in full less the cost of delivery and return if applicable.